You know when you're crawling around the backcountry in a pile of leaves and excrement, inching closer and closer to the flock of quails that you'll soon be calling dinner. You get the plumpest feathery treat in your sight, start to clamp down on the trigger and then think: "Oh, I should get a picture of this bird before I shoot 'im." At this point, you don't really want to dig around your pockets for a camera or you'll frighten your trophy bird away. Wouldn't it be stellar if you had a digital camera built right into your sunglasses? And wouldn't it be even better if those sunglasses were camo so that the creature had no idea that you're taking pictures of it? 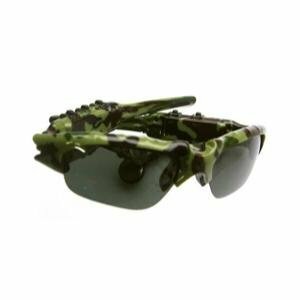 Check those two boxes with one pair of GK Vessa 313Camo glasses. These puppies integrate a 1.3-megapixel camera that shoots video and stills. And they hide it behind a camo frame that will disguise everything but the flash. There's 4 GB of flash storage built right in, and for your listening pleasure, the glasses include an MP3 player. All that hardware seems a little excessive for a pair of sunglasses. There comes a point when you really only want so much electronics sitting on your face, but I suppose it's up to the individual to decide if these glasses jump straight past that point. And do people actually wear camo sunglasses? I could see if you're rolling around the jungle floor of 'Nam covered in camo from head to toe, but for more casual affairs, it seems that because sunglasses sit on top of your big, smiling, white, black or yellow face that you really wouldn't be too concerned about camoing them over. But I guess it's better safe than sorry.